Home Best Homeschool Curriculum How Do I Protect My Homeschool Curriculum Time From Outside Demands? How Do I Protect My Homeschool Curriculum Time From Outside Demands? “Ding dong.” There goes the doorbell. “You’ve got mail.” Now the email. “Ding-a-ling.” And now a phone call. “Buzz.” A text message now, too? 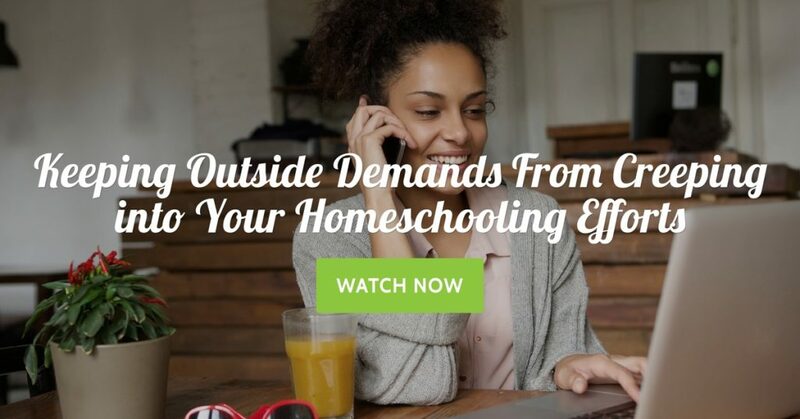 Do you wonder how you will ever keep your homeschool hours sacred? With all the distractions out there in the world, it’s hard to stay focused, but I encourage you to keep homeschooling hours a priority. Here are 3 keys to keep outside demands at bay. Turn Off Internal Distractions. The best homeschool curriculum allows you and your children to stay engaged in learning. Just as you are distracted by the doorbell, phone or computer, your child is distracted by it too. Turn off or mute the phone and computer. Focus on only getting on the computer if it is school related. Maybe you need to check a school-related email to make sure an activity is still happening or you are doing some subject learning on biology, but otherwise, keep the computer distractions until after your homeschool hours are over. Put Off Your To-Do List. I like to call these relationship distractions. Children thrive with routine and schedules. Start your homeschooling hours at the same time each day if possible. Run your errands, make your phone calls, schedule outside play and doctor visits before or after school hours. I’m not saying that if a great opportunity presents itself that you should turn it down just because it doesn’t fit into your routine (please allow adjustments where appropriate) because even the best homeschool curriculum sometimes get “messed-up” from time to time and that’s okay. For more posts about how to find the best homeschool curriculum for you and your child and keep your homeschool time a priority, become a member today. Define Your “WHY” in Homeschooling?